The complex health needs of the patient population: this is one of the reasons William Robinson, MD, chose to pursue a career in vascular and endovascular surgery. Vascular disease is often the product of hypertension, diabetes or high cholesterol. As a result, treating a vascular patient surgically requires collaboration with his or her primary care physician, as well as cardiologists, endocrinologists and other specialists, a process that Robinson relishes. In addition, his career choice enabled him to participate in an area of surgery that is notable for innovation. The steady stream of new endovascular devices is making it possible to treat a broader selection of patients in a less invasive manner with less morbidity and mortality. Add these reasons together, and the sum is the opportunity, as Robinson says, “to have a tangible and often immediate effect on a patient’s prospects” — an outcome he finds extremely satisfying. Could you talk about the issues that you and your colleagues consider in deciding whether to use an open vascular or an endovascular approach? Let’s begin with the advantages of endovascular surgery. Because it requires at most a very small incision, recovery time is markedly shorter compared to open surgery. It is often performed without general anesthesia, making it less stressful physiologically for people with other significant medical illnesses. As a result, it is associated with lower complication rates. On the other hand, we have 25 years of experience with open vascular surgery, and we know these repairs are durable. Because endovascular surgery is relatively new, we don’t have that sort of durability proven over time. We frequently see patients with lower extremity limb ischemia due to PAD. We have the choice of using an endovascular therapy, such as an angiogram and stenting of the arteries, or open bypass surgery. We might offer open surgery to a younger person whose medical risk allows it, but recommend an endovascular approach to someone who is considered too high a risk for general anesthesia. Are you often in the position of choosing between open vascular and endovascular surgery? These days, there is usually an endovascular option for most patients we see, so yes, we go through this process often. We have endovascular treatments for aneurysms, for both the thoracic aorta and the abdominal aorta. A large majority of PAD cases have endovascular options, which can range from angioplasty to stenting to atherectomy. There are also endovascular options for cerebrovascular disease like carotid stenting for the prevention of stroke as well as for symptomatic vein disease. We offer all these options at UVA. Innovations in endovascular surgery are arriving at an impressive rate. What areas of the field are you excited about? For PAD, the field has been focusing on improved device design and better drug-eluding technology. For aneurysms, the introduction of fenestrated and branched aortic grafts is transformative treatment. We are on the verge of having endovascular options for treatment of aneurysms and diseases of the aorta that stretch from the aortic valve through the aortic arch to the external iliac arteries. That’s a real milestone. UVA has a good track record of offering new endovascular devices soon after they are introduced. What makes that possible? We have an advantage as academic surgeons in an academic medical center because we are committed to following patients and evaluating outcomes. We also have the clinical research personnel and resources to do that effectively. That is part of our mission, and that allows us to attract clinical trials. The other reason is that we have assembled a really exceptional team of surgeons and specialists with a demonstrated record of successfully introducing advances in care. This is another important consideration for companies and trials. The net result for us is that we have cutting-edge technology and ultimately more options to offer patients. 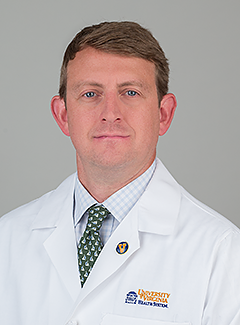 To schedule an in-office visit with William Robinson, MD, contact our Physician Relations team at 434.465.7996.